A first for many, a second for a few. Artists Beat the Flood took place at a summertime pace. With 16 splashing visual artists, 5 harmonious music groups, and numerous generous partners, we were able to launch a wonderful event, and a unique experience where the Red Room hosted a live art and music event at Huashan Creative Park 華山文創區, a first for both the Red Room and Huashan. Recognition is necessary for all of our supporting organisations and parties. Thank you to venue host Huashan and Emily Wang, coordinator for libLAB Studios. A special note to an individual who provided the essential supplies; Brendon Chen from Escape Artist contributed the canvases, attended, and participated in Artists Beat the Flood on July 5th with a glow of contagious positivity. And last but not least, thanks to all the volunteers from the Red Room community who helped make the day a success! 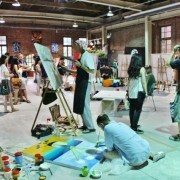 The silent auction took place all day as the artists worked their canvases. We are delighted to report that all paintings were sold by the end of the day! Red Roomers, we can proudly say that we have achieved our goal; this event has been a wonderful beginning to what we hope will be a series of live art & music events. Julia Kao, Grace Lu, Jeremy Chen, Constance Woods, Carol Yao, Ping Chu were covering the event and posting regular updates on facebook. Thank you for your wonderful photos of the art, musicians and the space. Stay tuned as the Dream Magician sets the scene for Stage Time & Juice this saturday, followed by a special visit by the Red Room Muse – Tina Ma. Stage Time & Wine will commence soon after at 6:30pm. Start the day with a bottle of juice or wine as we hope to see you this Saturday!